It’s here! Spring has sprung and warmer weather is on its way. This also means that it’s time to start deep cleaning our homes. I know, it’s a drag for many, but schedule the time and complete the project task by task. If you don’t know where to start, Martha Stewart has created a comprehensive spring cleaning checklist for you to download. The task list can be easily tailored to your home. Before you start cleaning, you’ll need the essentials. I love that so many cleaning products are eco-friendly, help reduce clutter and are made in cheery colors and patterns… just makes the task more fun, don’t you think? I’m totally getting that iPhone cablekeeper! 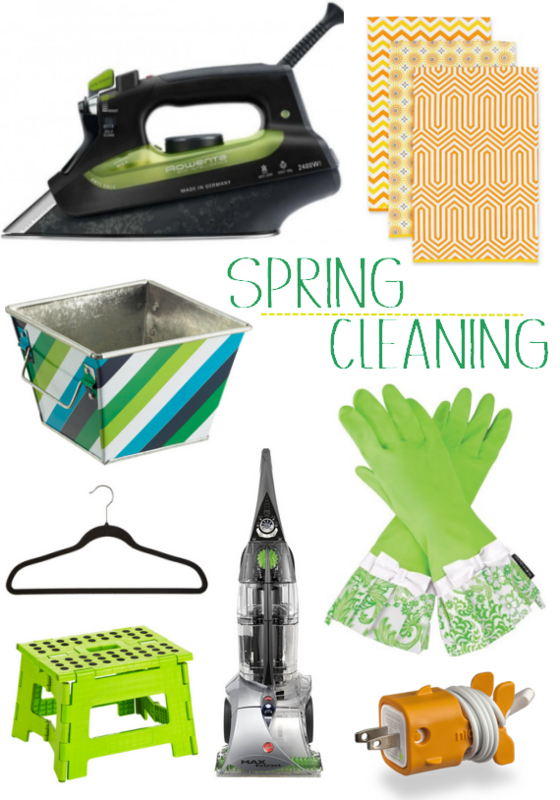 Happy spring & happy cleaning! The hubby and I were going to clean the windows this weekend. Got hit by the spring blizzard. Watching the snow fall now and looking through the dirtiest windows I have ever seen. The snow is pretty though. I need that cord keeper too! That thing is awesome. I too love the 7th Generation bathroom cleaner. It’s the best. I really love Mrs. Meyers products too. They smell lovely. Mrs Meyers is great too! Happy spring!! !